The New York Times bestselling author of Armed Madhouse offers a globetrotting, Sam Spade-style investigation that blows the lid off the oil industry, the banking industry, and the governmental agencies that aren't regulating either. This is the story of the corporate vultures that feed on the weak and ruin our planet in the process-a story that spans the globe and decades. For Vultures' Picnic , investigative journalist Greg Palast has spent his career uncovering the connection between the world of energy (read: oil) and finance. He's built a team that reads like a casting call for a Hollywood thriller-a Swiss multilingual investigator, a punk journalist, and a gonzo cameraman-to reveal how environmental disasters like the Gulf oil spill, the Exxon Valdez, and lesser-known tragedies such as Tatitlek and Torrey Canyon are caused by corporate corruption, failed legislation, and, most interestingly, veiled connections between the billionaires of financial industry and energy titans. Palast shows how the International Monetary Fund, World Bank, World Trade Organization, and Central Banks act as puppets and bandits for Big Oil. 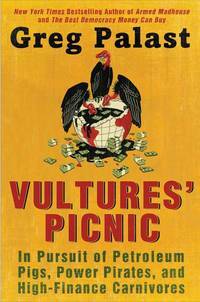 With Palast at the center of an investigation that takes us from the Arctic to Africa to the Amazon, Vultures' Picnic shows how the big powers in the money and oil game slip the bonds of regulation over and over again, and simply destroy the rules that they themselves can't write-and take advantage of nations and everyday people in the process.